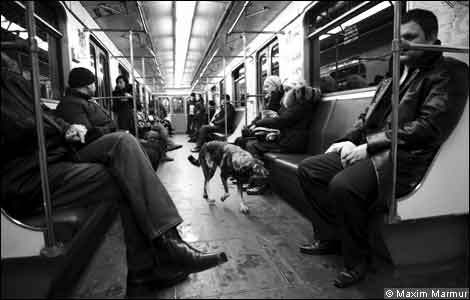 You may have heard about the stray dogs of Moscow — tens of thousands of them roaming the streets in their own packs, begging, and even riding the subway. In this Financial Times article from January 16, Susanne Sterthal interviews a biologist, Andrei Poyarkov from the A. N. Severtsov Institute of Ecology and Evolution, who studies the ecology of these dogs on his spare time. Poykarov’s unofficial conclusion: the dogs are becoming more wild. He places the dogs into 4 different niches, each of the niches occupying a different location, method of food acquisition, and, most importantly, relationship to humans. The homeless dogs don’t live with people, but hang out with them outside in public spaces. The beggars can not only smell who has food on them, but can tell who is most likely to give it to them. The scavengers’ relation to people is mainly trash-based, by digging through our dumps for food. The last niche is the real wild dogs: dogs that only interact with one another, view people as dangerous, and hunt for food. And this is in the 7th largest city in the world! In the 1940s, before his exile from the Soviet Union, a biologist named Dmitri Belyaev had similar interests to Poyarkov. Under the guise of studying animal physiology, Belyaev set up a Russian silver fox research centre in Novosibirsk, setting out to test his theory that the most important selected characteristic for the domestication of dogs was a lack of aggression. He began to select foxes that showed the least fear of humans and bred them. After 10-15 years, the foxes he bred showed affection to their keepers, even licking them. They barked, had floppy ears and wagged their tails. They also developed spotted coats – a surprising development that was connected with a decrease in their levels of adrenaline, which shares a biochemical pathway with melanin and controls ­pigment production. “With stray dogs, we’re witnessing a move backwards,” explains Poyarkov. “That is, to a wilder and less domesticated state, to a more ‘natural’ state.” As if to prove his point, strays do not have spotted coats, they rarely wag their tails and are wary of humans, showing no signs of ­affection towards them. So here’s the lesson: don’t let your babies out on the street at night, and dream of a post-apocalpytic Moscow landscape where dogs rule.